Here is a rose plant thats is blooming for the first time Say Hello!. Its a mild pink color pleasant enought to make you look at it for hours. It was dormant for sometime and a dash of good potting mix and vermicompost got the baby flowerin’ and Yes there is a basal cane too. I get so excited when I see a basal cane in my rose plant. Basal canes are those that arise from the bottom of the plant near the budding joint and usually they are very vigorous ,sturdy, bears more flowers and adds structure to the plant. To get basal canes in roses, fertilize them with nitrogen rich fertilizer and a dash of Epsom salt. thanks to you I was able to get hold of the panchakavya. now to use it and hope for good results. Is it good to allow the basal cane to grow or will it suppress the graft? Whenever I bought a rose plant I was advised not to let the basal cane grow. I have about 8 potted rose plants [this after i swore i would never buy them as they dont seem to thrive/survive in Chennai] but temptation got the better of me when i went to nurseries. They look like your rose plants when i bring them from the nursery . After that it is all downhill- they lose their leaves, buds are blackened and look like bonsai…………. Is it the Chennai climate i am up against? kindly let me know. Regarding the basal canes, I should have been more clearer posting that. All the roses that we get in nurseries are either grafted or budded. You can clearly see the graft/bud joint in the rose plant. The portion below is the stock plant. That has good root system but may not flower. Any growth of cane below the joint is called “Sucker”. I will let its name explain it. The leaf pattern will differ from the Scion’s leaf pattern. This way you can identify a sucker. It should always be CUT when you spot it. The growth that arises right from the joint or little above that is called a basal cane. That is part of the scion or the plant that actually flowers. The leaf will resemble the plants leaf and will be sturdy, very healthy and for sure flowers like crazy. Now to the Chennai Vs Rose part. I have had around 12 different rose varieties in pots when I was put up in Urapakkam(Near guduvancheri). The climate wasn’t an issue at all. That was my first time growing roses. Take my word for it. Roses need sunlight to grow, ample sunlight. 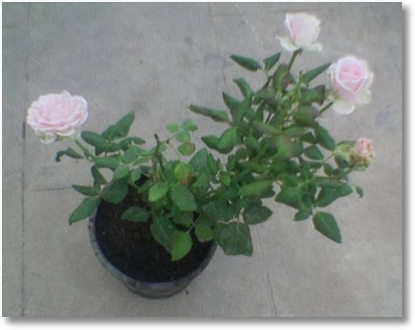 I kept the rose plants in terrace then and now in bangalore they are in terrace too. Given ample sunlight, and periodic fertilizing your rose plants will be way ahead of nursery plants. I feel chennai climate is just fine but needs more watering since sunlight during may -june can be really scorching. Most of the rose plants I have are perfectly healthy and there are few that wouldnt just get along with me. Things happen ;). Also I have to tell you a fact. Dont think nurseries have great plants. They only SHOW great plants. They have lot of tough ones too ;). We are talking about 1000s of plants in the nursery and they display only 100 healthy ones and not to forget they are constantly fed with heavy dose of chemical fertilizers to bloom and grow big in size. I too had this feeling sometime back about nurseries. They do this as their full time job.so.. Your write up on Roses was enlightening. I am from Chennai and if i happen to come to Bangalore can i have a look at your garden? Thanks Giri. Sure drop by my place whenever you are in Bangalore. I am looking for Epsom salts quite urgently. Most pharmacies I have called don’t seem to have it. Where do you buy it? You can collect it from me. I will send you an email. Dear GG.. I am also unable to find epsom salt around me here in Delhi. Even many of the seed store give a puzzled look to me. Some thought that I am confusing gypsum with epsom. Well how much does it cost and Can I get it online? YOu can get it pharmacies.